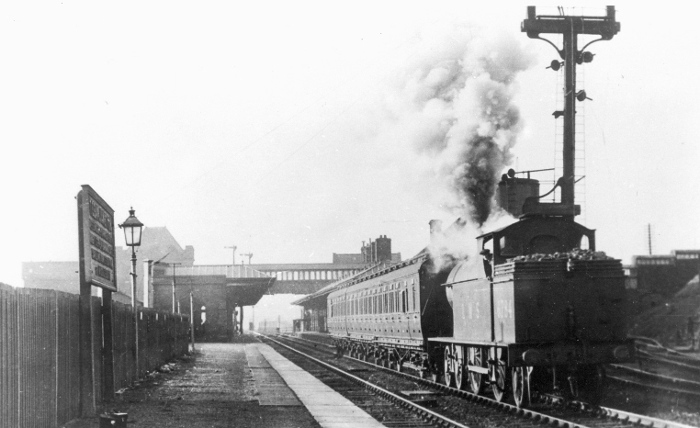 Shows LNWR 'Precursor Tank' LMS no. 6784 leaving a station, which might be Tebay up platform. Peter Spedding has found a photo that might help - iv in Yeadon's 'Compendium of LNWR Locomotives 1912-1949 Part One' - and another view is plate 104 in Ted's 'LMS Power - the Coronation class'. But neither of these fixes it beyond argument. My first thought was no. So I reached for my copy of Over Shap to Carlisle by Harold D. Bowtell (whom I met a good few times at Manchester Locomotive Society meetings) - and as usual, I was wrong! It IS Tebay. Page 77 top - there is the very same photo, by H.C. Casserley, June 1935, an Up Slow Train headed by an Oxenholme Precursor Tank. Undoubtedly Tebay circa 1930. I have a Lens of Sutton photo no.66308 showing the same view in 1948, by which time LMS upper quadrant signals had been installed.